20 Colors Available Beads India Beaded Tassel Necklaces, Size: 18"-26"
Boho long wooden necklace Spiritual Mala necklace/yoga necklace. 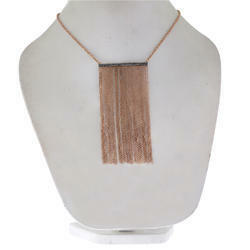 Gold-tone/Gunmetal brass necklace with Austrian crystals and resin stones. Measurements: Length 29.75"-31.75" adjustable x Width 3.5"
To meet diverse requirements of our clients in the best possible manner, we are offering a comprehensive Thread Tassel Necklace at very reasonable price. Product Name : Silver Gold Plated Aquamarin Blue Topaz Interlink Tassel Necklace. 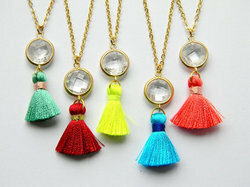 Being a leading firm in this industry, we are offering a high quality range of Ladies Tassel Necklace.